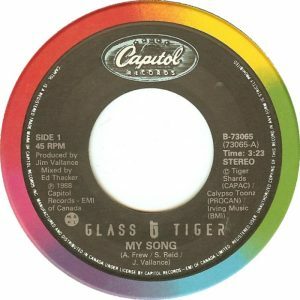 Discovered in the summer of 1984 when a band from Newmarket, Ontario, Glass Tiger was initially called Tokyo. As Tokyo, they spent two evenings performing before capacity crowds at Toronto’s Maple Leaf Gardens opening for Boy George and Culture Club. Their dynamic original sound captured the moment, and the race to sign them was on. Tokyo, which had become a major force in suburban high schools and the Ontario club circuit, officially became Glass Tiger early into 1985 when a record deal was finally signed with Capitol Records. The band consisted of Alan Frew on vocals and guitar, Sam Reid on keyboards, Al Connelly on guitar, Wayne Parker on bass and Michael Hanson on drums. After being introduced to Jim Vallance, who had previously produced albums for Prism and Bryan Adams, Glass Tiger was off to the recording studio to work on their first album. The Thin Red Line set a record for being the fastest selling debut recording in Canadian history, going gold within weeks of its release. To date, this album has received four Platinum records in Canada and earned Gold status in the USA. One of Glass Tiger’s many hit singles “Don’t Forget Me (When I’m Gone)” climbed all the way to #2 on the Billboard Hot 100, followed by “Someday” which peaked on the US charts at #5. Both songs were written by Jim Vallance and made Canadian history when Glass Tiger won successive Juno’s a year apart for Single of the Year from the same album. With five Juno awards and a Grammy nomination under their belt, Glass Tiger was invited as concert openers for Tina Turner’s 1987 European tour. Glass Tiger’s second release Diamond Sun, established Glass Tiger’s reputation as being one of Canada’s better recording artists at crafting a song. Diamond Sun ended up charting four of its six single releases into the Canadian RPM Top 30 singles chart in this order: “I’m Still Searching”, “Diamond Sun”, “My Song” and “(Watching) Worlds Crumble”. The album was awarded Double Platinum status based on its sales. “My Song” is a song about the power of song and the difference it can make to a person’s life. By singing their song (or songs) the singer can return to their home, their roots. The lyrics make it possible to also conclude that by singing the song, the singer feels at home in themselves. Singing the song is like flying with the angels, and it sets aside fear. In this case, the song is autobiographical. 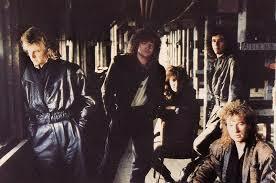 The singers are the members of Glass Tiger and they are singing their songs on tour for everyone. Before each song begins there is silence as the singers, the band get ready to play. Then the song begins. Waiting for the silence is important for any singer who is performing on stage. The silence, however, brief, provided a moment to be present, to ground oneself in honoring the song they are about to sing. With a song, a person can travel distant lands and still feel at home when they sing that song. “My Song” was a collaboration by Glass Tiger featuring The Chieftains. A traditional Irish band, The Chieftains were formed in Dublin in November 1962, by Paddy Moloney, Sean Potts and Michael Tubridy. The band had their first rehearsals at Moloney’s house, with Tubridy, Martin Fay and David Fallon. Their sound, which is almost entirely instrumental and largely built around uilleann pipes, has become synonymous with traditional Irish music and they are regarded as having helped popularise Irish music across the world. Between 1962 and the late 70s the Chieftains were semi-professional. In 1973, their popularity reached North America when their four studio albums released in the UK between 1964 and 1973 became available across the Atlantic. In 1975 The Chieftains worked with Stanley Kubrick on the Academy Award-winning soundtrack for the Kubrick film Barry Lyndon. The group recorded the soundtrack for the 1982 Canadian film, The Grey Fox, about an American stagecoach robber, Bill Miner, who moved to British Columbia after 1901 and subsequently robbed a train near Mission, BC, in 1904. The Chieftains collaborated with Van Morrison in 1988 rot release the award-winning album Irish Heartbeat. Over the years The Chieftains have recorded with numerous recording artists including Luciano Pavarotti, the Rolling Stones, Madonna, Sinéad O’Connor, Roger Daltrey and Glass Tiger. The Chieftains have won six Grammys during their career. After the Diamond Sun was released drummer Michael Hansen left the band. While Glass Tiger didn’t replace him with a drummer until Chris McNeill in 2000, they had studio musicians who were drummers hired for their next album and single releases. Glass Tiger’s third album, Simple Mission, sold well and went Platinum in Canada. It featured the hit singles “Animal Heart” and the band’s duet with Rod Stewart on the Celtic tune in praise of Glasgow, “My Town”. After the Simple Mission album Glass Tiger had went dormant, but reformed and began to tour again ten years later in 2003. As of December 27, 2017, Glass Tiger has 48 concert dates scheduled between February and June, 2018.